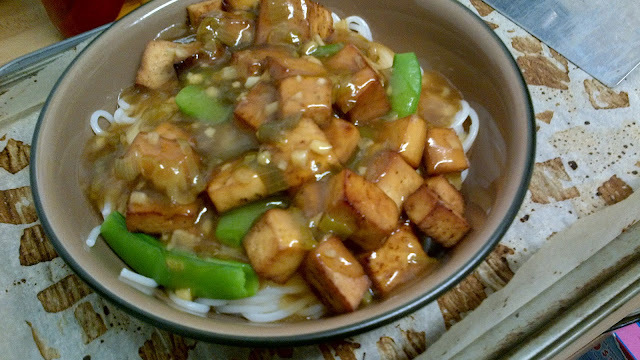 My husband and I love General Tao tofu from vegweb.com. This is such a great recipe on it's own with no modifications. We have made it countless times but not so much lately. The fried tofu is not so healthy and I have been trying really hard to get back to a healthy life style. Fortunately I figured out how to prepare it a great deal healthier so I will post the modifications here. 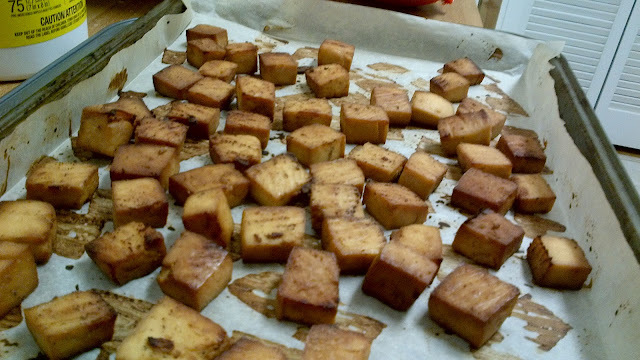 The baked tofu turned out so well it was difficult to stop munching on them on their own. Mix the last 3 ingredients in a shallow dish. Mix cubed tofu so it is completely coated and marinate for a few hours, mixing every so often. Line a baking sheet with parchment paper and bake in a pre-heated oven (400 degrees) for 20 minutes. Turn over and bake for 5 more minutes. Add first 4 ingredients to small sauce pan on medium heat and fry until garlic is soft (about 2 minutes). Add next 4 ingredients and bring to boil. Add cornstarch-water mix and mix in to thicken. Remove from heat. Cook rice noodles according to package. Throw some vegetables into the boiling water. Drain when ready.